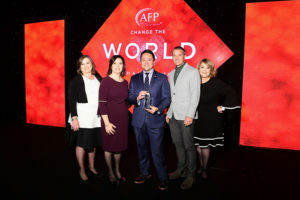 Change the World with a Hero’s Heart – Association of Fundraising Professionals (AFP), has selected the HomeAid Houston/BuildAid team as “Outstanding Volunteer Service Harvey Heroes,” an honor shared by several others including the JJ Watt Foundation and Jim McIngvale with Gallery Furniture. Boys and Girls Country Director of Development Melissa Simon, nominated the HomeAid and BuildAid team. The team joined all recipients of the award at the National Philanthropy Day Luncheon in November where they were honored and celebrated as “Harvey Heroes.” Additional categories honored include the Maurice Hirsch Award for Philanthropy, Outstanding Volunteer Fundraiser, Outstanding Philanthropic Foundation, Outstanding Community Service Organization and Outstanding Fundraising Professional. Days after Hurricane Harvey swept through Houston, BuildAid was formed in partnership with HomeAid, GHBA and the David Weekley Family Foundation (DWFF), to help homeowners restore their flooded homes. The initiative was started with a $1 million donation from the DWFF with another $5.5 million grant from the Hurricane Harvey Relief Fund. Once the homeowner completes an application on the BuildAid website, the qualification process begins within days. Those meeting the requirements will quickly be matched with experienced builder members of the GHBA who will walk them through a finish selection process and the actual remodeling. BuildAid builders include David Weekley Homes, Partners in Building, Chesmar Homes, Colina Homes and Sandcastle Homes. The builder team is led by Chris Yuko, director of BuildAid. In June, BuildAid was also awarded a $350,000 grant from the Rebuild Texas Fund to support BuildAid’s efforts. This grant will allow the initiative to provide new furniture to homeowners who are receiving restoration services.